BBC: How does a judge know which bloggers to accredit? Cox: … This is actuallyhttp://www2.blogger.com/img/gl.link.gif the issue they had. They didn’t want to put up a sign saying ‘bloggers welcome’ and then get every knucklehead with a web site showing up at their door, so they were interested in working with our organization at least for two of those seats because we have a large membership of bloggers and we vet those bloggers and we will deliver to the court, you know, people who are particularly qualified to cover this trial. These "particularly qualified" bloggers include the individual who asked "how should bloggers cover the Libby trial" after the trial had already begun? BBC: What can a blog bring to court coverage that any kind of conventional reporter, dashing out of the court, you know, to file a story or jump on to the camera, can’t? BBC: But isn’t the point about reporting a court case to report the court case? You know, the opinion has to wait until the reporting has been done. Cox: Well, I guess you haven’t read many blogs then because you don’t have to wait to be into the story to form an opinion. It's interesting that Cox mentions the incorporation of opinion. 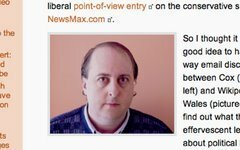 Even though crooksandliars.com is recognized for leaning left of center in its political views, and even though crooksandliars.com is also represented at the Libby trial through the Media Bloggers Association's access, the person representing crooksandliars.com is far from being one of their "traditional" bloggers. Cox has attacked Crooks and Liars in the past for its left-wing affiliations and jumping on the pro-Olbermann bandwagon, but when discussing the MBA's presence at the Libby trial, it may be productive to examine the bloggers themselves rather than their affiliations. Murray Waas - the representative for crooksandliars.com - began his career working for muckraker Jack Anderson and those early experiences seem to have informed his current reporting. He's been praised for his investigations, but at the same time, he has also been called a a primary contributor to fostering a culture of scandal. This is quite consistent with Cox's right-wing, populist views of the role of bloggers vis-a-vis the mainstream media. In Cox's own words: "readers don't trust journalists because they play a 'wink wink' sort of 'inside game' where they don't tell the readers what they know and don't demand that sources 'own' their own words." Cox is criticizing the media's perceived "inside game" while, at the same time, advocating for an elite cadre of professional bloggers? Another blogger's work, Outside the Beltway author James Joyner, clearly leans towards the right of center. Political views aside, his blogging is certainly responsible. His point of view, however, is unambiguously Cox's point of view as well. When taken together, what does this mean? In one way or another, the Media Bloggers Association representatives at the Libby trial are an extension of Bob Cox's extreme right-wing views. This is by no means a fair and accurate snapshot of the blogosphere, but rather a representation of Bob Cox's political affiliations. Two of the nation's most popular political blogs - Daily Kos and the Huffington Post - are absent from the live coverage of the Libby trial. Even though they are not MBA members, wouldn't their presence have assured the vanguard blog coverage the MBA claims to be providing? It most certainly would have, but then again, their presence would also have gone against Cox's personal views.